Inside:If you’re feeling a little discouraged by the posts that claim you can make thousands in your first month of blogging, this blog traffic report will shed light on what you should actually expect. Learn how to get readers to your new blog, as well as what to expect the first month. If you’ve read anything about beginning blogging on Pinterest, you’ve probably seen the posts. With stats like these, everyone should start a blog. Right? It is possible to do the above with a new blog? Apparently. Is it likely? I’m gonna say no. I would have loved to get 20,000 pageviews this month, and though posts like these can be encouraging, they can also leave a beginning blogger a little discouraged. But the truth is, we are all starting from the bottom. There are many big bloggers out there. And guess what? They all started from zero. They too had good days and bad days. Frustrating days. I’m guessing that most of them were not instant successes. I worked on my blog for months before I launched. While this is not a tactic that is for everyone, it is what worked for me. I am a mom of two little ones and I work full time. Although I’m super busy as it is, blogging is just something that I’ve always wanted to do. You can read more about my why here. And I made it to one month! It’s been a rollercoaster of emotions. There were days when I was sure that I was rocking blogging, and other days filled with frustration. I have published 13 posts in the last month. Unexpectedly, this post has brought in 30% of my traffic. Which is insane. It is the post that I almost didn’t publish. I was expecting this post or maybe this one to be my most popular. First, let’s look at where I started. Before launching, I had a landing page for starting my email list (with this freebie!) and I started to grow my Instagram account. I launched with 7 posts. Because of these three factors, my first two days of blogging were two of my highest performing days. 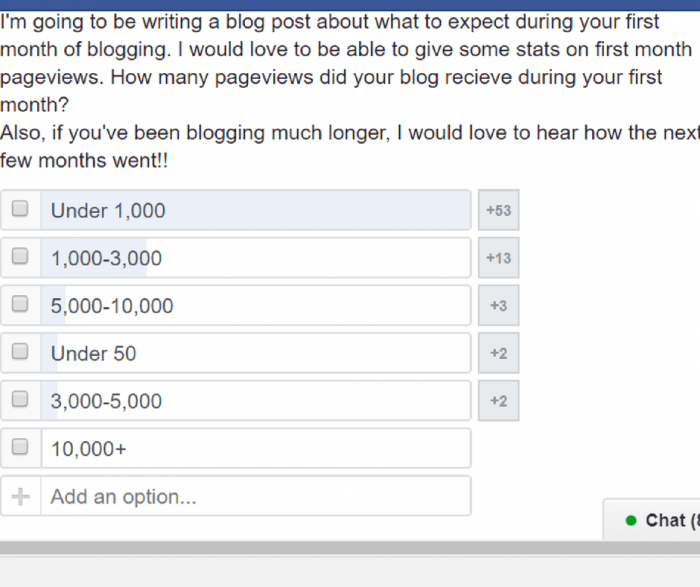 I polled other bloggers in one of the Facebook groups that I’m in to see what typical first month page views look like. Getting 20,000+ pageviews in your first month is unrealistic. I came in at almost 3,000 pageviews (not as good as my friend Alexandra at Coffee and Coos with 6,000 (! ),) but still very successful. At first, I was kind of randomly pinning and making it up as I went. I know that if I had continued on that path, I would not have seen much growth throughout my first month. Pinterest is confusing. The algorithm is always changing and you need to have a Pinterest strategy in order to make Pinterest like you. Once I implemented Carly from Mommy On Purpose’s manual pinning strategy, my page views soared. If manual pinning sounds too time-consuming for you, I later purchased a lifetime membership to the best blogging community/resource out there, which teaches you everything you need to know, including a solid Pinterest strategy. You can read my review of Billionaire Blog Club here. In the beginning stages of your blog, you will spend most of your time promoting. And promoting. And promoting some more. Facebook groups are necessary in helping to get your pins out there. And necessary for connecting with other bloggers who are willing to help you out. Find some Facebook groups and get active. 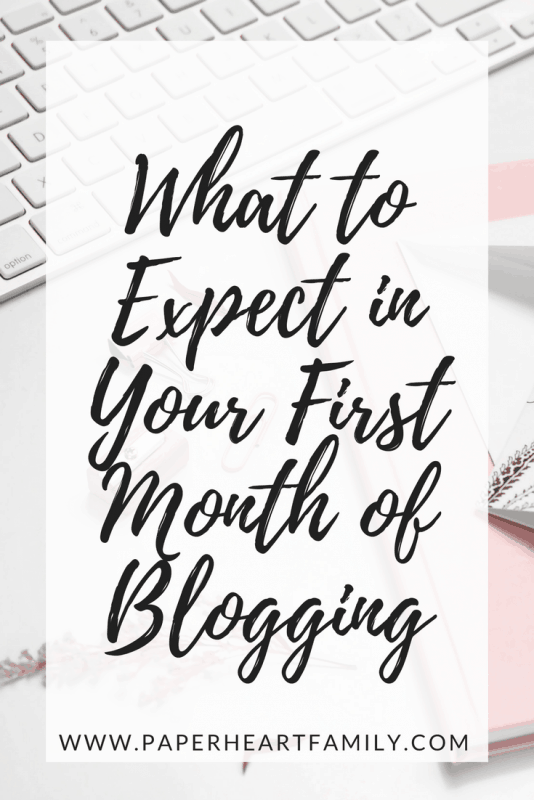 Okay, so now let’s talk about what you should really expect during your first month of blogging. Expect that the majority of your time will NOT be taken up by writing blog posts. There is so much more to blogging than simply creating posts. You also must grow a social media presence, develop a Pinterest strategy, find or take beautiful photos, create pinnable images, format your post, optimize your post for SEO, include inbound and outbound links, and promote, promote, promote. Expect that you will have good pageview days and bad pageview days. There is nothing more discouraging than when you have your highest pageviews one day, and the next day, crickets. It’s normal. There were days when Pinterest hated me. And then there were days when Pinterest loved me. Pinterest traffic fluctuates a LOT. Organic search traffic is much more predictable, and it’s never too early to start working on Pinterest traffic. Billionaire Blog Club helped me a ton with Google traffic (and like, everything else!). No matter how prepared you think you are, you will still have to work really hard to get viewers to your site. As I said before, I worked hard on my blog for a long time before launching. I didn’t want to look like the new kid on the block. I have beautiful vertical pins and a beautiful theme. I researched blogging for hours and hours. I mistakenly thought that my beautiful site and pins would magically lead thousands of viewers to my blog with little effort from me. Expect to feel discouraged at some point. I had many moments of discouragement. When I first started my Instagram account, I was starstruck by all the beautiful mommy blogger feeds. I began to feel like I could never compete. When I didn’t get as many pageviews as I expected on a certain day, I was frustrated. You need to remember that blogging takes time. But if you’re patient? It just might pay off. Despite the ups and downs of this past month, blogging has lit a fire in me. I am excited to see where it takes me and I am having so much fun. Expect to have your own level of success. Let’s go back to the beginning of my post. Instant success as a blogger is not likely. Blogging is a marathon, not a sprint. I interviewed four of my favorite new mommy bloggers. These ladies have great content and have promising futures in the blogging world. But they’ve also experienced the same highs and lows, disappointments and realizations that blogging is hard work. Be sure to check out their blogs. They are all amazing. What surprised you the most when you started blogging? A: What surprised me the most was the vast amount of information available online for beginning bloggers looking to start a blog. I love that there is a community of bloggers who genuinely want to help each other out and see each other succeed with their own blog. It is as if we are all in this together and there is not a feeling of competition. Did you have a time when you questioned your ability or felt discouraged? Absolutely! And I still do. It is hard not to compare yourself to other bloggers who are already rocking it and seeing success. It’s hard not to want to be at your end goal right away and accept that it takes time. Blogging is a marathon, not a sprint. I’ve been steadily working on my blog for 3 months now, but here and there when I’m feeling overwhelmed I take a few days off to reflect. Once I’m re energized I feel more confident in my decisions and progress. Do you consider your first month a success? I do. Looking back at what I accomplished, I was leaps and bounds ahead of where I was when I first decided to start a blog. I spent LOTS of time (like every minute of free time I got!) researching, digesting information, learning and implementing many things that are necessary to run a successful blog. What advice would you give an aspiring blogger? Be ready to be completely overwhelmed! Plan on investing lots of time up front and investing a small amount of money. Be prepared for your brain to never shut off because you will be constantly thinking about your blog. It’s totally normal to stay up late and then set your alarm for 5 am to get up before the kids so you can have a bit of quiet time focusing on your blog! Join Facebook groups for bloggers where you can ask questions, get advice/input and see what others are doing. If you want to make money from your blog, you have to think about it as a business right away and come up with a strategic plan and goals. A business takes lots of time to build. It’s a marathon, not a sprint. When I decided to start a blog, I thought the hardest part would be creating content. That’s actually the easy part. The hard part has been teaching myself WordPress and learning how to promote my site. I probably spend 25% of my time creating content and 75% of my time promoting it and working on improving my site. With blogging, there is so much to learn. It’s easy to look at other bloggers on Pinterest who tell you that they’ve reached so many pageviews or made a certain amount of money. It can leave you feeling really discouraged. Its hard not to compare yourself to others and feel like you’re not as successful because you didn’t hit certain goals in a particular time frame. However, the beautiful thing about blogging is you can go at your own speed. I’m not quite through my first month of blogging, but I would consider it a success so far. I’ve got my site up and running, created two posts per week, made a small amount of income through affiliate marketing (and I mean small, but it’s still so exciting), and had over 6,000 pageviews. I have plenty of things I want to continue to work on, but I’m happy with the progress I’ve made so far. My advice to an aspiring blogger is “JUST GO FOR IT”. Learn as you go. The best way to figure out what you’re doing is to do it. Cindy also wrote a post about her first month blogging experience which you can find here. I guess I was surprised at the number of Facebook groups for bloggers supporting bloggers. I wasn’t expecting to hook up with a supportive network and imagined I would be doing this alone, at least for the first few months. It definitely was a pleasant surprise to be able to make connections and feel supported right away. I definitely felt nervous when launching my blog and questioned myself quite a bit. It was a little scary to be putting myself out there, but it has turned out fine. I’m still struggling with sharing my blog with my friends and family. I’m pretty pleased with my results after just a month. I am getting a small but steady number of pageviews a day. I also got accepted to Google Adsense right away and am slowly earning a little income. I would encourage those who are considering starting a blog to jump in and do it! I debated for years and really wish I had started earlier. There’s no time like the present! I was so surprised of how many details you have to take care of when having a blog! I think people think it is just like writing in a journal everyday, and it is so much more. I think I question my ability every other day, hahaha. There is definitely a lot of work to be put into it, and I question whether or not I have the time to really do it the way I want to.There are some days I just really have to focus on 1-3 things and forget the rest! I do! My launch day had 1400 pageviews and 53 subscribers! Also, my pictures have been featured on different hubs on Instagram. This was a personal photography goal of mine! I have learned so much this past month, which I also see as a success. Stay as far ahead with your writing as possible. Always edit your pictures. Connect with other bloggers as much as possible through social media. And have fun with it! There you have it! What surprises you the most about starting a blog? I am in month 4 of my blogging and business and while I still haven’t reached 1,000 views total I still see it as a success. I am learning so much from so many others who are on the same journey and experience the same struggles that I do. I am so happy to see that you are doing so well and this post is huge motivator. Great info! My blog is only about 5 months old and everything is still very new, so I am trying to figure it all out. Thanks for sharing. Thanks! And join the club, blogging is tough! Pinterest is such a great way to get traffic! I have gotten more views of one post this year than the whole first year that I blogged! I am still a ‘New bee’ and one thing i can say about blogging is… i learn something new EVERYDAY! and i love it!!! I love it too! It’s addicting, right? Hi Brenda! I’m a new blogger and this was such a refreshing post to read. I definitely still have a ton to learn about blogging, but I’m enjoying the process. So glad you loved it! When I was looking for a post like this to see what it’s really like, I couldn’t find anything! These are some great tips and Ive been looking for a Pinterest course. I’ve been totally surprised as how much time I’ve put into the non-writing parts of blogging too. And equally surprised by how much fun that part can be! Still working on Pinterest but it’s getting there. It’s crazy, right? I swear writing takes up about 5% of my time. It’s hard not to get defeated when you see people that throw out these insane numbers they get. But like you said, it’s important to remember that they are not the norm! And at the end of the day, you have to love what you do or it all won’t be worth it in the end, awesome page views or not! Very true! It’s a lot of work, you definitely have to love it! I love this!!! Great job lady! Thank you so much for including me! Absolutely! Thanks for being a part of it!! ? I love, love, LOVE this post! I think sometimes in the internet culture we assume everyone is doing better than we are. I love that you talk about what the first month of blogging is REALLY like. Truly, great post. Jaymi, thank you SO much! It’s the kind of post that I wanted to read in my first week of blogging ? This is such a wonderful post – especially as a newbie blogger. I agree that sometimes seeing those posts: “I got 6 bazillion page views in my first month!” can be incredibly discouraging. I appreciate this other perspective as well 🙂 Thank you so much for sharing. It is discouraging! It makes you wonder what you’re doing wrong! This is exactly how I feel — I’m a new blogger and it’s been such a whirlwind my first month. But I wouldn’t change it or give up – it’s been a blast & I love feeling like part of a community. Congrats on a great first month! Just know that you’re not alone in feeling that way! Best of luck to you! This post was so helpful!! I’m a new blogger as well and often feel very discouraged! I could NOT love this more! Thanks for being honest and real! Great job in month one!!! I agree that Facebook groups are super helpful. Keep up the good work. Thanks Devon! I don’t know what we would do without FB groups! I am about a month into blogging and many of the struggles you have mentioned I have gone through or am going through. This is a great post for new bloggers and I plan on using some of your advice to help me further grow my blog. Thank you for sharing! So glad to let others know that you are not alone! This is such a great post! Really helpful! Great post! Thanks for including me!! Thanks for being a part of it ? Thank you so much for thinking of me! I’m flattered! Thanks for featuring me! I love how your post turned out! So very helpful for new bloggers entering the scene! Glad you liked it! Thank YOU for being a part of it! Thank you for this very encouraging post! For being realistic and honest! You’re welcome! It’s the kind of post that I wanted to read when I was in my first month.